OS X El Capitan desktop. Screen shot courtesy of Coyote Moon, Inc. 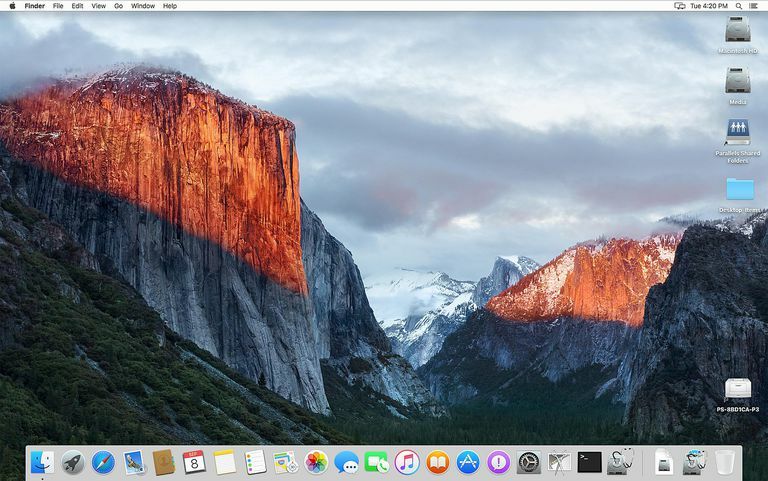 It's the second option, a clean install of OS X El Capitan, which we'll address in this guide. If you're going to install OS X El Capitan on your current startup drive using the clean install method, then you will by definition erase everything on the startup drive as part of the process. That’s everything: OS X, your user data, anything and everything you have on the startup drive will be gone. No matter why you're undertaking a clean install, you should have a current backup of the existing startup drive's contents. You can use Time Machine to perform this backup, or one of the many cloning apps, such as Carbon Copy Cloner, SuperDuper, or Mac Backup Guru; you can even use Disk Utility. The choice is up to you, but whatever you choose, it's important to take the time to create a current backup before you start the installation. Clean Install on Empty Volume: The first option is the easiest: installing OS X El Capitan onto an empty volume, or at least one whose contents you don’t mind removing. The key point is that you're not targeting your current startup volume as the destination for the clean install. This type of clean installation is easy because, since the startup drive isn't involved, you can perform the clean install while booted from the current startup drive. No special, custom-made startup environment needed; just start up the installer and go. Clean Install on Startup Volume: The second option, and perhaps the more common of the two, is to perform a clean install on the current startup drive. Because the clean install process erases the contents of the destination drive, it's obvious that you can't boot from the startup drive and then try to erase it. The result, if it were possible, would be a crashed Mac. That’s why if you choose to clean install OS X El Capitan on your startup drive, there's an extra set of steps involved: creating a bootable USB flash drive that contains the OS X El Capitan installer, erasing the startup drive, and then starting the clean install process. If you haven't yet downloaded a copy of OS X El Capitan from the Mac App Store, you'll find instructions for how to do this in our article: How to Upgrade Install OS X El Capitan on Your Mac. Once the download completes, come on back here to continue the clean install process. If you’re going to perform the clean install on your Mac's current startup drive, continue on to Step 2. Once you finish making the bootable USB flash drive, we're ready to continue. Insert the USB flash drive containing the OS X El Capitan installer into your Mac. More than likely it's already connected to your Mac, but if it isn't, you can connect it now. After a short delay, your Mac will display the OS X Startup Manager, which will display all of your bootable devices. This should include the bootable USB flash drive you just created. Use your Mac's arrow keys to select the OS X El Capitan installer on the USB flash drive, and then press the enter or return key. With the startup volume erased, you're now ready to begin the installation of OS X El Capitan. In the OS X Utilities window, select Install OS X, and click the Continue button. If you chose to perform a clean install on a new or empty volume (not your startup drive) as described earlier in the guide, then you're ready to start the installer, which you'll find in the /Applications folder. The file is labeled Install OS X El Capitan. The El Capitan installer will display the default target for the installation; this isn't always the correct target. If it is correct, you can click the Install button and skip ahead to Step 6; otherwise, click the Show All Disks button. A progress bar will display; after a while, an estimate of the remaining time will display. The time estimate isn't very accurate, so this is a good time to take a coffee break or go for a walk with your dog. Once all the files are installed, your Mac will restart and you'll be guided through the initial setup process. The Welcome screen displays, asking you to select which country your Mac will be used in. Make your selection from the list, and click the Continue button. The Transfer Information to This Mac window will appear. Here you can choose to move existing data from a Mac, PC, or Time Machine backup to the clean install of OS X El Capitan. Because you can do this at a later date using the Migration Assistant, I recommend selecting Don’t Transfer Any Information Now. You chose a clean installation for a reason, including the possibility that you were having issues with your previous installation of OS X. Before you bring data over, it's a good idea to make sure your Mac operates without issue with a clean install first. Make your selection, and click Continue. If you chose not to set up your Apple ID, a sheet will drop down asking if you really don't want your Apple ID set to log you into the various services. Click the Skip or Don’t Skip button, as you wish. The Create a Computer Account option will display. This is the administrator account, so be sure to note the username and password you selected. The window will look slightly different, depending on whether you chose to use your Apple ID or not. In the first case, you'll have the option (pre-selected) to sign into your Mac using your Apple ID. In this case, you only need to provide your full name and an account name. A word of warning: the account name will become the name for your Home folder, which will contain all of your user data. I highly recommend using a name with no spaces or special characters. If you decided not to use the Apple ID in step 6 above, or if you removed the check mark from the Use My iCloud Account to Log In item, then you'll also see fields for entering a password and a password hint. Make your selections, and click Continue. The setup process is complete. After a few moments, you'll see the OS X El Capitan desktop, which means you're ready to start exploring the clean installation of your new OS.